Looks like we’re heading for a real, honest-to-goodness government shutdown tomorrow due to a childish Congressional food fight over budgets and health care. Already this year, thousands of government employees faced furloughs due to sequestration, and now they’re looking at an indefinite unpaid leave. It’ll last until Congress can play nice and make a deal on the budget and health care, and who knows when that will be. But when the government shuts down, not the whole government shuts down. “Essential” personnel will report to work, including those whose jobs are tied to safety functions, like air traffic controllers. And so will employees whose paychecks come from mandatory, not discretionary, spending — like those whose positions are funded from the Highway Trust Fund. Same with the Federal Motor Carrier Safety Administration. All 1,102 employees will go to work as usual. Well, bully for FHWA and FMCSA. The pain will be felt on the fourth floor of U.S. DOT — and at transit agencies around the country — when 91 percent of Federal Transit Administration workers go on furlough. The 21 workers assigned to Hurricane Sandy response work are excepted, as are the three working in the Lower Manhattan Recovery Office, which has been helping to rebuild the transit system there since 9/11. Four other unspecified employees have been deemed essential. The rest of the 501 agency workers are out of luck. This affects about 1,300 grantees around the country. Transit projects under development will stall. Safety oversight, a task newly given to FTA under the MAP-21 bill, will be curtailed. Research and technical assistance will grind to a halt. It’s not for lack of money to pay these grants, DOT notes. It’s for lack of money to pay the people who sign the grant checks. Sec. Anthony Foxx will stick around, of course, but he’ll be pretty lonely, with three-quarters of his staff out on unpaid leave. (That doesn’t include 229 workers who get paid by the Volpe Center in Cambridge, Massachusetts, whose Working Capital Fund pays for various pieces of U.S. DOT as part of its mission to “advance technical, operational, institutional and managerial innovations to improve the nation’s transportation system.”) Polly Trottenberg, the Under Secretary for Transportation Policy, also gets to keep half her staff. Half the Office of Intelligence, Security, and Emergency Response will stay on duty. Everyone else: See ya when Congress comes to its senses. Over at the Federal Railroad Administration, more than half of employees will be out enjoying the fall weather. Safety staff will stay on the job. But even having “safety” in the name of your agency doesn’t save you — 56 percent of the National Highway Traffic Safety Administration will go home today not knowing when they’ll be coming back to work. Meanwhile, only five people out of 399 at the Office of the Inspector General will come to work during the shutdown. At the Surface Transportation Board, 140 positions are subject to furlough — everybody but the three presidential appointees. You wouldn’t think the work of the Research and Innovative Technology Administration, which includes the Bureau of Transportation Statistics, would be one of the few agencies still reporting to work when only “essential” workers are on duty. But 609 out of 702 positions there are funded by two fee-for-service organizations: the Transportation Safety Institute out of Oklahoma City and the afore-mentioned Volpe Center. “Both of these organizations have adequate resources to fund staff for a limited period,” DOT reports. The DC Metro has noted that it’s not a federal agency (though the feds cover a big chunk of Metro’s capital costs and $150 million a year for operations) and will not close in the event of a shutdown. However, more than 15 percent of the city’s workers are federal employees, and if a lot of them are taking some involuntary time off, that could mean a ridership crash. Metro has already alerted riders that they might reduce peak capacity if that happens. 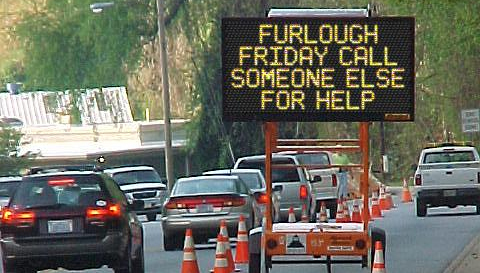 U.S. DOT’s furlough plan document is eerily similar to a document prepared in 2011, when a shutdown appeared imminent. A last-minute deal averted the shutdown that time. Will we — and 18,481 U.S. DOT employees — be so lucky now? h/t to Larry Ehl at Transportation Issues Daily for publicizing the document. It is really sad. If the Democrats would just admit Obamacare is evil and defund it, we would not be having this problem. We have to make a stand where we can, and this is one place where we have leverage to do something. Unlike what those idiots on AM radio would like you to believe, that wouldn’t stop implementation. You’d need to repeal it. And it’s too popular to get the votes, especially when the Republican alternative is “NOTHING.” And we’ve seen them fail at that nearly 40 times rather than actually moving on to do the people’s business. Thanks to the GOP, no significant legislation from either party has made it to the President for signature since they got the majority over 5 years ago. They just block everything that isn’t GOP, and they’re not drafting legislation of their own. The reality of the situation is the Democrats and the American people wanted to bring us a modern, single-payer healthcare system. The GOP wanted the Heritage Foundation’s plan that was originally proposed to the house by Newt Gingrich in 1997. When the GOP got everything they wanted with healthcare, they put Obama’s name on it and complained loudly. How the hell are you supposed to take that kind of behavior seriously? How do you negotiate with an intransigent and intentionally spiteful party? Seriously, get a clue and read a history book. Or even a newspaper archive. Asking for all federal employees now to go on strike and do. Real closure and hurt the bastards in congress . So let’s all of os stick together. Why doesn’t it become a BIGGER issue that Congress, the President, all of their staff, the Secret Service, etc. are ALL getting paid when they are federal government employees as well!! !